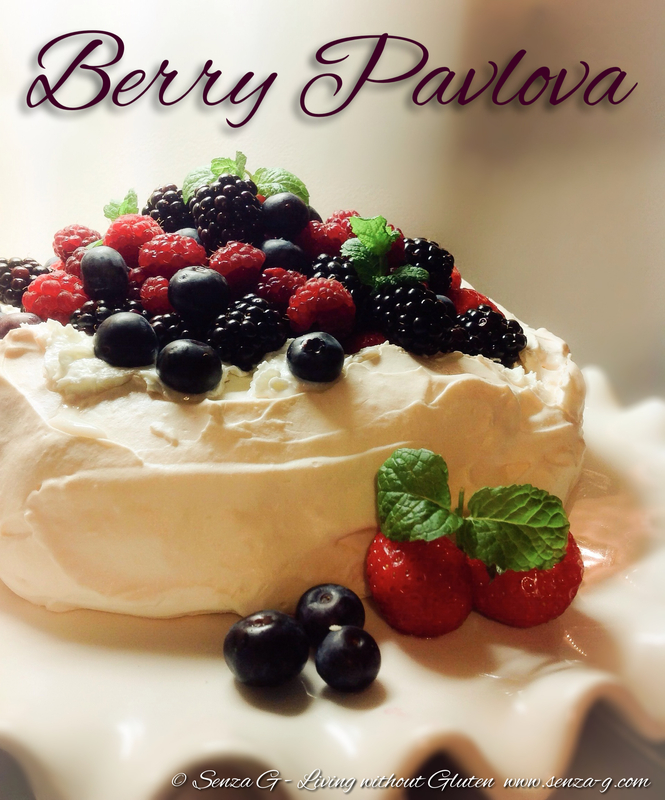 The Pavlova is said to have been created after the Russian prima ballerina, Anna Matveyevna Pavlova (1881-1931), who toured both Australia and New Zealand in 1926 and Australia again in 1929. The Kiwis say they created it and the Aussies say they did. So, in the meantime, whilst they are still battling that out, here is the recipe for a fool proof pavlova, which is basically a sweet meringue crust, filled with freshly whipped cream and topped with fruit. You can make either one large crust or else individual pavlovas. Before you start, prepare your baking sheet with baking paper. Either wet the bottom of the sheet with water or with a little oil to prevent it from moving when you pile the meringue on it. I lightly oil the top too so it will slide off easily after it is baked. Using a hand held mixer, beat the egg white until soft peaks form. Start adding the sugar spoonful after spoonful, but do not stop mixing. You will see that the egg whites will change from soft peaks into glossy stiffer peaks. Keep mixing to ensure all the sugar is dissolved. Slow down the speed and add the vinegar and mix just for a couple seconds. Now sprinkle the cornflour on top and using a CLEAN plastic spatula, fold in the cornflour. Do not overmix. Now start piling the meringue in a large circle on the baking paper, leaving an indentation in the middle, and building up the sides. You can make it also in a rectangle if you like or into individual mini nests. Place the baking sheet in the oven and immediately turn down the temperature to 120C. Leave to cook for about 80 minutes. Do not open oven door whilst it is baking. Do not let it get brown. When the timer goes off, LEAVE in the closed oven for about an hour or longer, preferably till it cools down completely. When completely cooled, place on a serving dish. Fill the cavity with fresh whipped cream and top with your favorite fruit.